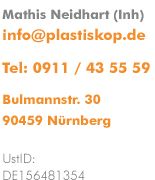 Plastiskop appreciates your interest in its products and your visit to this website. Your privacy is important to us and we want you to feel comfortable visiting our site. The protection of your privacy in the processing of your personal data is an important concern to which we pay special attention during our business processes. Personal data collected during visits to our websites are processed by us according to the legal provisions valid for the countries in which the websites are maintained. Our website may include links to other websites which are not covered by this privacy statement. When you visit our website, the web servers of our provider Strato store as standard details of your browser and operating system, the website from which you visit our website, the pages that you visit on our website, the date of your visit, and the IP address assigned to you by your internet service provider; Other Personal data is only stored if you choose to submit it to us, e.g. during request for quotation or in the order process. On our website we do not use Social Plug Ins or Facebook-Pixel. We do not collect anonymous user data and do not use profiling. Your E-mail address is not used for advertising, we do not send newsletters. Optional we use Your E-mail address for following up our quote we sent on Your request. Your image files for the purpose of creating of photo-products are stored only local after Your submission. After finalizing and shipping Your order the image files will be stored up to 8 weeks to be able to handle complaint or reorder. After 8 weeks Your image files will be irretrievable deleted if no archival storage was agreed. We partner with another party to provide specific services like printing or shipment. These parties have only access to inevitable information for the purpose of providing these services.